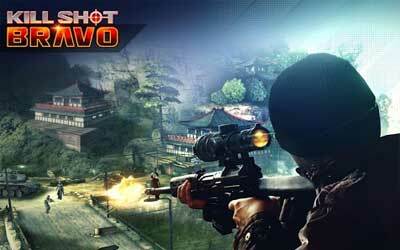 Kill Shot Bravo APK 1.9 is categorized as smartphone first person shooter game. You can download it in Google Play Store under the action game category. Hothead Games is also developed other first person shooter games such as Kill Shot and Bravo SWAT Strike. In this game, you are going to be playing as a special forced soldier. You need to follow more than 500 different cool missions. Each mission located on certain places across the world. Most of the missions require you to eliminate threat to peaceful places. In order to doing so, the game is going to take you into the enemy territory. Therefore, you need to be careful since your enemy knows their territory better than you do. Review from gamers who already play this game that it is not only an addictive game but also a challenging game. The gamers love this game not only due to the interesting plot. They also like it because of the realistic graphic. Kill Shot Bravo also incorporates achievement system and leaderboard mechanism. You can compete with players over the globe as well as do some PVP action in the game. You can achieve points as you complete the quest missions. In order to complete, you need to use the best weapons. The game uses various type of gun such as sniper rifles, assault rifles, shotgun, and even machine gun. If you want to make your weapons stronger, you can upgrade them. As the armor, the game provides various gears such as helmets, body armors, uniforms, facemasks, gloves, boots, goggles, and so on. To make your character stands out, you can easily customize the appearance. Using the cool weapon and armor, you will be able to shut down drones, exoskeleton suits, robots, and other interesting enemies. Kill Shot Bravo for Android is recommended for those of you who enjoy sniping enemies from far away. Obtain the newest Legendary Weapon, the HH Cassius, coming soon in the LEGENDARY CRATE. Rack up Victory Points during Alliance Wars to earn rewards as you pave your way to glory. Your enemies have ambushed you during your vacation. Play over 95 new missions to show them why that was a bad idea.